Online orders received by 12:00pm CST Monday through Wednesday will be processed and shipped via UPS two-day shipping the same day in a temperature controlled package. Any online orders received after 12:00pm CST Monday through Wednesday will ship out the following business day. FREE SHIPPING NOW AVAILABLE WITH VISBIOME ORDERS. You will receive a confirmation with tracking information, once your order has been shipped. A physical address must be provided during the ordering process since UPS does not deliver to post-office boxes. If an order is undeliverable or not accepted, shipping charges may apply. A signature for delivery is not required, however, it is at the discretion of the UPS driver to leave your package at your door. Magnolia Pharmacy is not responsible for stolen orders. Magnolia Pharmacy will ship anywhere in the United States. 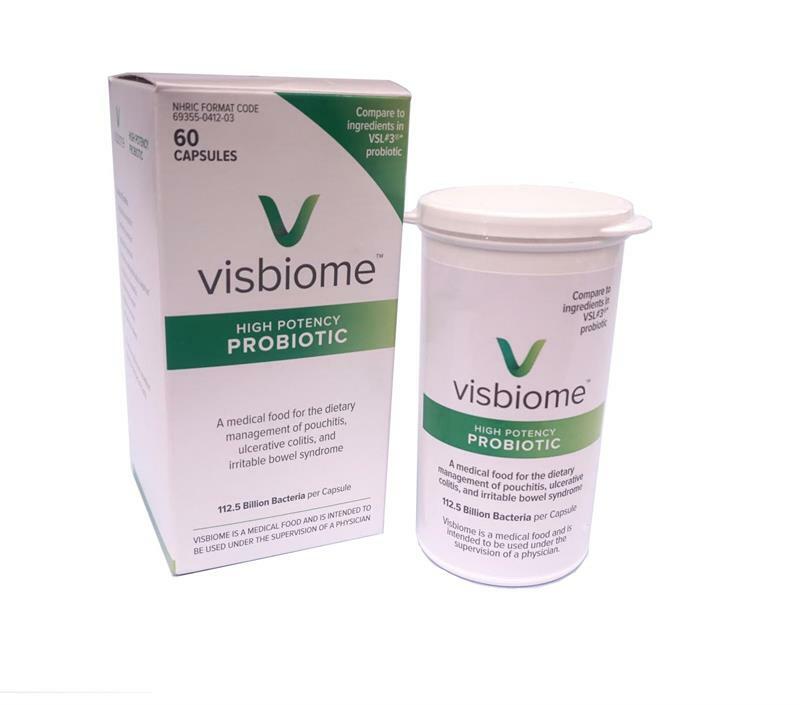 Visbiome™ Regular Flavor - Visbiome is a high potency probiotic medical food for the dietary management of IBS (Irritable Bowel Syndrome), ulcerative colitis (UC), and pouchitis. In the mid-1990s, Professor Claudio De Simone, M.D. invented a proprietary blend of probiotic strains (the “De Simone Formulation”) and collaborated with VSL Pharmaceuticals, Inc. to produce and market it as ‘VSL#3,’ a trademark owned by VSL Pharmaceuticals, Inc. In 2014, Professor De Simone decided to leave VSL Pharmaceuticals and is now collaborating with ExeGi Pharma, LLC to produce Visbiome, a probiotic using the same proprietary blend of probiotic strains that De Simone originally invented. Visbiome contains the De Simone Formulation, one of the most widely studied probiotics with over 60 published human clinical studies. *VSL#3® is a registered trademark of, and is manufactured exclusively for, VSL Pharmaceuticals, Inc. Visbiome is manufactured exclusively for ExeGi Pharma, LLC and is not affiliated with, endorsed by, or distributed by VSL Pharmaceuticals, Inc.
How many clinical studies have been conducted using the De Simone Formulation in Visbiome? To date there have been over 60 human clinical studies involving over 5000 patients in conditions such as IBS, UC, and pouchitis. Additional data has been accumulated in patients with liver disease, Crohn’s disease, radiation enteritis, and other conditions. Is Visbiome a generic equivalent of the VSL#3*? Visbiome contains the same strains, in the same concentrations and proportions, as, is therapeutically equivalent to, and can be considered a generic of, the VSL#3®* probiotic blend as produced before January 31, 2016. Consume 1-8 packets daily as directed by your physician. Adjustment of the intestinal flora can take a few days or weeks; it may take up to one month for the colonization of the gut to become optimally stable, if consumed on a regular basis. Serving Size and Dosage Each packet contain at least 450 billion live probiotic bacteria. Each carton contains 30 packets. Each individual capsule contains at least 450 billion live probiotic bacteria. Recommended dosage: 1-8 packets daily depending on condition. Mild abdominal bloating has been reported in the first few days of consuming Visbiome™. This is generally a physiological adaptation of the microflora, which usually diminishes within 3-4 days. If bloating persists, the patient should reduce their intake for a few days. Visbiome™ should be refrigerated (39-46°F, 4-8°C). If stored under refrigeration, the product is guaranteed through “Best if used by” date. Visbiome can be stored at room temperature for up to one week without adversely affecting potency. 450 billion bacteria per packet available in 30 count boxes. Lemon Cream flavored powder. High potency probiotic. Visbiome is a medical food to be used under physician supervision. Regular strength Visbiome does not require a prescription. 18230 FM 1488 Suite 100, Magnolia, TX 77354 Copyright ©2019 Magnolia Pharmacy. All Rights Reserved.